The EuroLotto has now expanded beyond holding lottery draws by launching its own online casino. The casino, which is licensed in Malta, offers Net Entertainment’s vast library of slots as well as a number of table games and video poker. 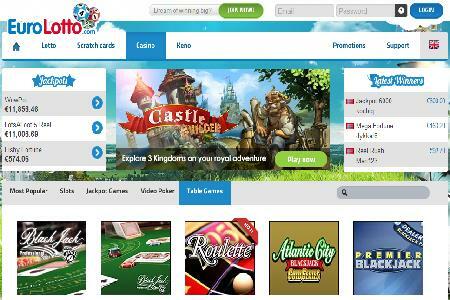 The EuroLotto has launched its own online casino offering Net Entertainment’s collection of slots, table games and more. EuroLotto Casino has a fairly unique welcome bonus. Before making a deposit all new players are given 5 free “Treasure Hunt” scratch card games. Then after making a deposit all players can receive 20 free spins on the slot game “Gonzo’s Quest”. Furthermore, there is a first deposit bonus of 100% up to €25 available. At present this is it as far as bonuses go, but they are likely to expand as the casino becomes better established. In addition to Net Entertainment’s collection of slots, the casino has games from Microgaming, Yggdrasil Gaming and Amaya Gaming. The casino is instant play which means that there is no need to download any software, but for the time being there is no mobile casino. As one would expect from a casino operated by EuroLotto there are numerous banking options including Fast Bank Transfer, MasterCard, Visa, Visa Electron, NETeller, Paysafe Card, Skrill and Trustly.